“What a waste of time!” the old woman said when she found me curled up in the corner nose buried in a book. I blinked up at her, annoyed that she had interrupted just as I was getting to the good part and perplexed as to why she felt she had any right to interrupt me. It wasn’t like I had asked for her opinion. I couldn’t think of one nice thing to say in response so returned to the sentence marked by my right index finger. But, like an unnecessary secondary character, she of course didn’t take the hint and go away. “I said what a waste!” she said louder and someone leaned around the bookstack and shushed her. “I heard you the first time,” I said without looking up. I looked up and smiled the way my best friend said made her think of a cat when it has the upper hand and its pretty doesn’t know it yet. Apparently, it can be quite terrifying, if you know me. This woman, however, did not. “If you think that, it’s a wonder you’re in a library.” I stretched my grin wider. “Well, I never!” Her cheeks flushed as she turned and stomped away, her arms full of what I imagined had to be the most boring nonfiction books the library had in its collection. A novel tumbled off the top shelf, narrowly missing her head. I went over and picked up the novel, which had thankfully landed spine down on the floor. “That was a very silly thing to do.” I smiled, a real smile. “She’s not worth losing pages for, you know.” I slid the book back into its place on the shelf. “It’s not a waste of time,” a voice behind me said. “I know that,” I replied to no one but the books and resumed reading. They blamed the bee-eaters for the decimation of the honeybee population. It wasn’t hard to see why. It was in their name after all. No matter that the colonies of bee-eaters hadn’t expanded in the last century. No one could prove they weren’t the problem so they had to go. A decree came down from the courts that all the bee-eaters had to be “made scarce”. A stupid euphemism for killing them. They couldn’t come right out and say it, though, not with the protests in the beginning. But then the protestors left or were made scarce. I didn’t ask, at least not in pubic. Everyone in a town that was near a colony was required to “make scarce” any bee-eaters found. Proof was required every fortnight or else fines were imposed. It was ridiculous, but then so were the people who wanted to blame the birds for the plight of the bees. The officials at the highest courts announced yesterday that all the bee-eaters were gone and the crops would be better this season. The cameras panned to a cheering crowd. It looked staged to me. But then, that’s what I think about a lot, staging. You can find anything on the Internet, they say. So I’ve seen, which works for me, for what I do. You see I did my duty. I “made scarce” the bee-eaters. I pretended I didn’t know what they were talking about when they asked about alleged sightings of iridescent jeweled birds way down by the river, back where no one sane ever goes. Who are they going to believe? Some city folk or an old woods hand like me? “Nope, no one here but me and the finches. Ain’t seen any since the decree.” And I smile and whistle and go back to my work. And they walk away. Because they don’t really want to know, do they? No, they want to go home and close the book. They leave because they want to, because staying would be the harder thing. Some days it is easier to be courageous than others and some days it is easier to be yourself than others. But, when we think about it, what other choice do we have? 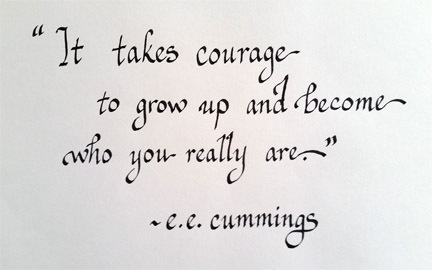 Today’s quote reminds us it takes both courage and growing up to become ourselves. I find in this quote reassurance and a swift kick in the pants to get moving. Reassurance because sometimes it feels too hard to be courageous–especially if it means sticking out and not fitting in. Though, at this point in my life, I’m not sure who there is left to fit in with as it is pretty obvious I’ve forever lost my invitation to whatever the cool kids are doing–but the great thing is as I’ve gotten older, I don’t really care anymore about fitting in. It’s also a swift kick in the pants because I should be more courageous and I should not be afraid of being who I am. Even if that’s a fantasy-writing, bookbinding, baking, reading, hiking person who sometimes doesn’t always know what to say at a networking event. The quote makes me want to be me more and there is no time like now to get on with becoming a better person, a unique person. But, even as we become stronger in who we are and more accepting of who we are becoming, there will always be people, situations, and times when it is hard. But that is when we have to dig deep and be grown-up in how we interact, think, and do. I hope that we all can continue to grow and become who we are meant to be (and hopefully includes increasing all our good qualities and ridding ourselves of as much of the bad as we can). And I hope, as we find our courage, that we help others find theirs, too. And maybe, just maybe, with a lot of people doing this (and acting like the grown-ups we want to be), we can make the world a better place, too.